According to the request, the position will involve travelling outside of the UK for up to three months at a time (who doesn't want to?! 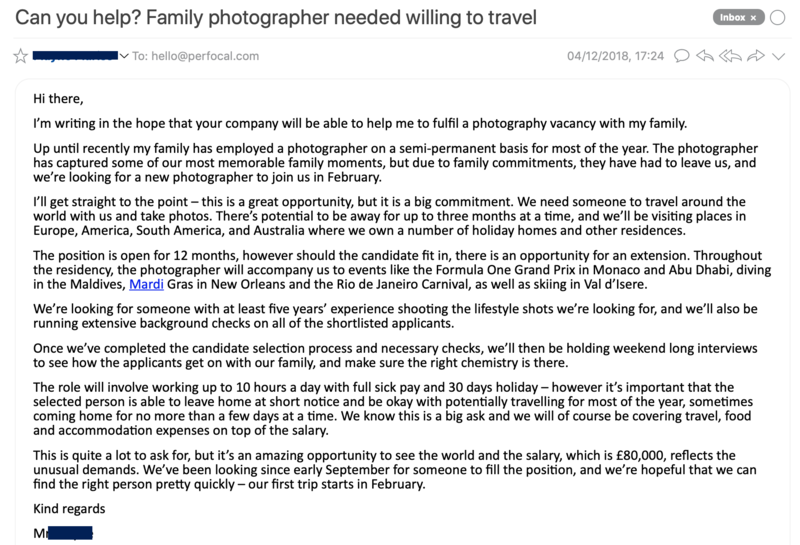 ), and hopeful candidates are warned that they must have at least five years’ experience in landscape, travel, and/or fashion photography, and be subject to a full background check. They have asked us to help them find someone to fill the position – which we don’t think will be too much of a problem, especially with a salary like that! We still love to connect customers with photographers after all, even in incredibly unique circumstances! If you're a freelance photographer simply looking to fill in your calendar gaps, feel free to learn more about Perfocal too as you might be able to get photography jobs with us! We're currently available in most major UK cities, with plans to expand internationally.